Wherever there is a spice you'll find a drink or infusion, and cloves and clove tea are no different! Whilst researching the various herbs and spices for this website, one thing they all seemed to have in common, you can make a tea with them. This tea is very warming, and you can really taste this spice, and the subtle hints of nutmeg and cinnamon. The lemon juice gives it a nice slight tang. Pour through a tea strainer and, if using, add the lemon juice or honey or both. 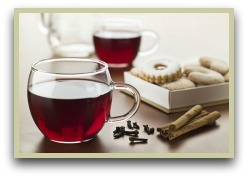 Click here to go to the main spiced tea page. If you enjoyed making this tea, then have a quick look at my spice and herbal tea recipes book. Full of easy-to-make, healthy drinks and infusions that anyone can make. Available as an e-book that you can download and start using immediately. Click for more information. There are a lot of clove recipes for tea out there, but I prefer to make my own unique version, therefore the recipe above is my own tried, tested and trusted adaptation. And it's really easy to make. Herbs and spices are full of vitamins, minerals and antioxidants etc, so drinking them even when you're not ill or suffering from an ailment is a great way of enjoying their health and well-being benefits that you may not otherwise get to appreciate. Read more about the health benefits and medicinal uses of cloves. More Spice Tea Recipes You May Enjoy!